Ben Affleck made jokes about his film career during a high school graduation speech Friday while giving tribute to a graduating student he befriended years ago. Students at Falls Church High School and family members gave a standing ovation to Affleck following his speech, in which he praised 19-year-old Joe Kindregan, a disabled student he met in 1998 on a film shoot. The two built a close friendship. "Everything I learned about life that really matters ... I learned from Joe," Affleck said. Kindregan suffers from ataxia-telengiectasia, a rare, degenerative genetic disease. Over the past decade, Affleck has helped Kindregan raise money to develop a cure. The close nature of the pair's friendship was evident; Affleck planted a kiss on Kindregan's forehead after being introduced and later playfully hit him with a rolled-up program. 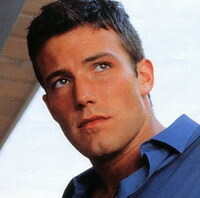 The two met in 1998 when the Kindregans came to watch a crew shoot the film "Forces of Nature," which starred Affleck. The actor noticed Kindregan, then 10, in his wheelchair and struck up a conversation. Affleck said Kindregan has since been on the set of all of his films - "He liked being on the set of `Daredevil' a lot more than being on the set of (box-office failure) `Gigli.' But he was too polite to mention it," Affleck said. Kindregan introduced Affleck to the audience by saying "He is married to the cutest girl (Jennifer Garner) ... but most important he is the best friend you could ever have." Kindregan declined to be interviewed. Affleck, dressed in a traditional graduation gown, sat on the dais next to Kindregan and other school officials and shook hands with graduating students. A few were bold enough to ask for a hug, and Affleck obliged. "He's a good hugger," said graduate Melinda Wodatch. She said Affleck's presence added to a memorable event. "I think all the kids were actually listening to his speech," she said. Garner attended the graduation but did not participate in the ceremonies.